Creating a new garden from the ground up or renovating an existing one is an arduous task. It also takes knowledge- knowing plant species and where to plant them, microclimates, soil, drainage, functionality, flow, how to plant, buying materials, aesthetic appeal just to name a few. Designing your own garden can be a satisfying project to tackle yourself, but hiring a professional landscape designer could and most likely will save you time, money, and hard work in the long run. So why hire a landscape designer and what is the process of working with one? Evaluating the site is an important first step for the landscape designer to assess details on the site. The designer has an eye for this and will likely see things that typically may go unnoticed. This could be landscape issues such as invasive plants, plant diseases, or drainage issues. A landscape designer also notes the character of the site such as the microclimate, aesthetic style, views, and how to interpret your own personal taste into a garden you’ll enjoy for a long time. A good designer will look at the needs of the site and connect this with your desires for the garden. 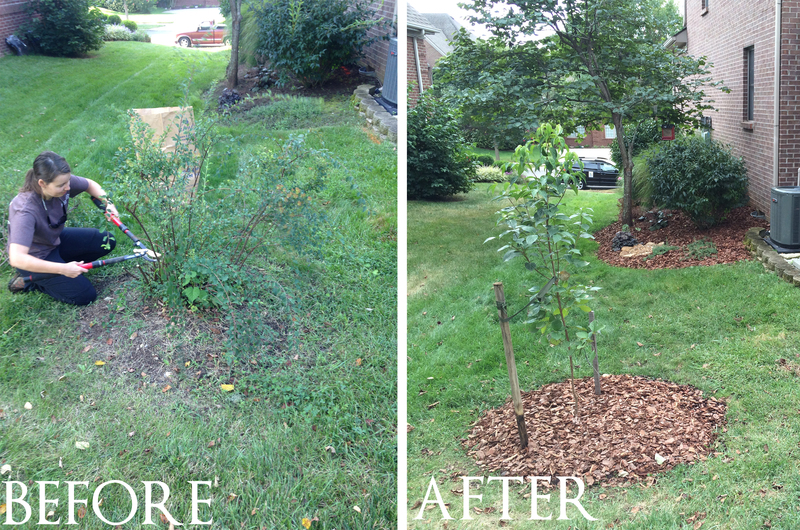 This homeowner was tired of the half dead boxwoods and roses that was part of the home’s foundation plantings. She desired an updated look that included reds, yellows, and oranges and that would have interest all year long. It’s a good idea for the client to write down as many thoughts they have about their current garden and their future garden as they can. This includes a list of needs, wants, and a budget. Having some images of landscapes you like is an added bonus. Before a consultation, I often send the client a short questionnaire to help them begin thinking about their site and so I can learn more about their intentions for the landscape. It’s important to find a designer that is the best fit for you. Is their work custom to each client and site? Or do they follow the same style with the same plants? Do your research and see if the designer has any social media sites that displays their work, style, and personality. Using Pinterest or Houzz is a great way to save ideas to a board or ideabook. It’s easy to share these links or bring up on a mobile device. Landscape designers all have a different process and how they implement their fee. Design is a process and goes through phases until a final design is created. It is like creating a piece of artwork, but a landscape design needs to be practical and one that the client likes. Many designers begin with a consultation and usually has a design review before creating a final design. The consultation and site visit is an important dialogue between the designer and client and is the initial step in the design process. The notes I take during a consultation help me to develop design ideas as I create sketches and make out plant idea lists back at the design table. At this stage I put together a quote for the design. I then discuss with the client these design ideas where we can look over where the design is going and we can tweak details in the design. 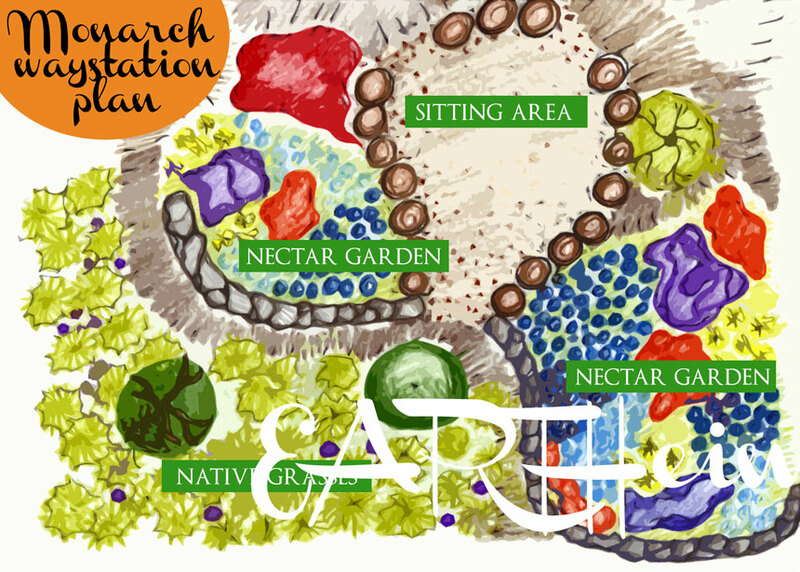 A final design is then created with detailed plans and plant list. This preliminary design sketch helped the homeowner envision a Monarch Waystation that also had two rain gardens and a seating area. “There are a lot of generic landscape designers out there, but a really good one is going to listen to the site and pick plants that will work there.” says landscape designer, Steven Hamilton. 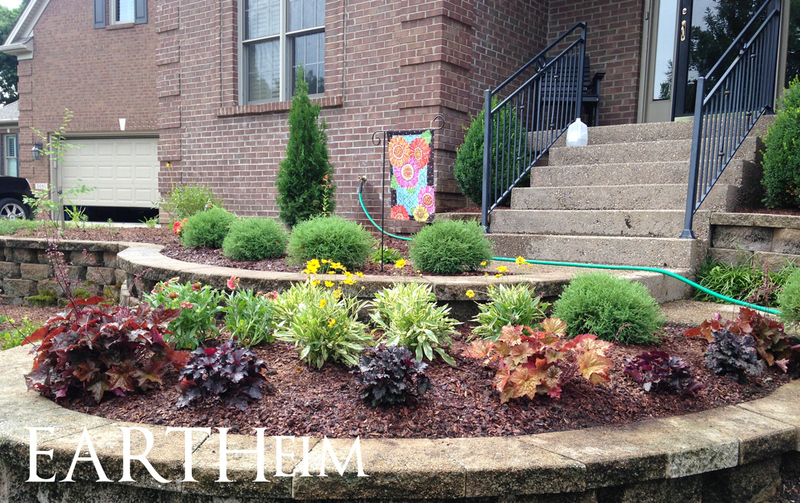 How does a landscape designer save me money? A landscape designer can save you money in the long run by helping avoid costly mistakes. It’s important to pick plants for the right spot, whether this means knowing a plant’s requirements to thrive and stay healthy, its growth habit, its spread, maintenance, and whether it’s in general a good or bad species to use in the landscape. Choosing the wrong plant can mean replacing it or removing it, which can end up being costly and worrisome. A landscape designer will also know techniques to keep your garden healthy and the best materials to use. I also offer garden coaching to help do-it-yourselfers learn how to install their plants and materials and I’m available to aid in plant placement before installation. Knowing how to properly install plants is key for their health which may also save you money by preventing disease and their decline. This is especially true for trees, which can be costly to purchase and a time investment. This spirea shrub had become quite unattractive over a few short years and was sending thousands of seedlings out into the landscape. It was replaced with a dogwood that was mulched and staked well to ensure its establishment as a young tree. Thank you for pointing out that it will help the landscaping contractor if the client already has an idea about the kind of look that they want and has already set a budget for it. If I were the contractor, that would really help since that will save a lot of time. Due to this, I will start talking to my hubby about the garden. After all, we have yet to determine whether to go for an enchanted garden or a Zen garden.